We left Taos Monday morning. After we kicked Kristen to the curb in Santa Fe <she flew out from there> we got on our way to Winslow AZ and couldn't wait to get to the La Posada and The Turquoise Room. I hope you click the link and read about this wonderful historic site and the art work. It's sooo nice to go on vacation, but even nicer to come home. I want to show you some cool things I bought on the trip. I got a couple of tchotchkes for the house. 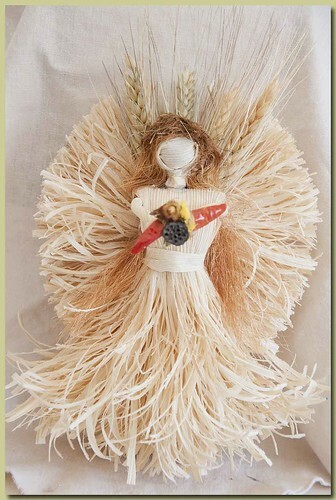 This is a kitchen angel made from dried corn husks. She resides prominently on my refrigerator door. 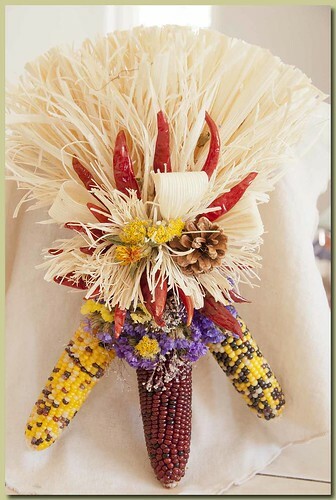 This is made from dried corn husks also and adorned with dried corn, chilis and dried flowers. Not sure where I'm going to put this one yet. I bought both of these at the Santa Fe Farmer's Market. my favorite rice for paella, an asador, smoky bacon-chipotle salt and some szechwan peppercorns. 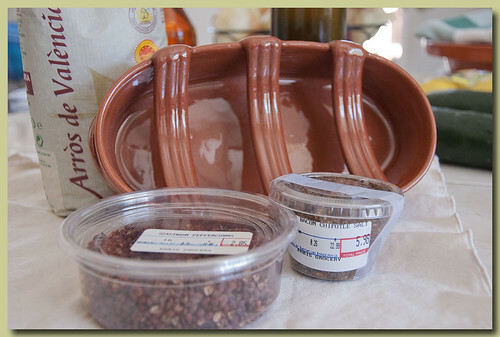 An asador is a clay Spanish sausage or linguica "cooker" Here's how it works. "Fill with a high spirited alcohol, place your favorite linguica or spanish chorizo on the cross bars, light with a match. After the bottom side begins to crisp, turn once and finish cooking on the other side. Remove to a cutting board or plate, slice into bite size pieces and serve with toothpicks and a nice tall beer. Approximately 11 inches long by 5.5 inches wide and 2.5 inches tall. Asadores are kiln fired at 2000° and are brittle when new. They should be soaked in water for six hours prior to use for the first time. They must be immersed in water rather than filled with water as that can cause the glaze to craze. If you live in a very dry climate you may want to resoak occasionally." I've wanted one of these for years and now I finally have one. I can't wait to use it. 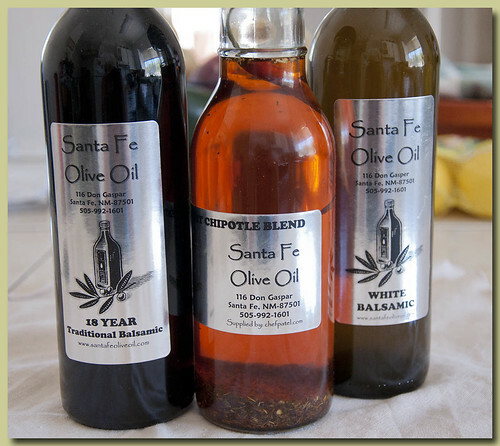 18 yr old Balsamic vinegar and some white Balsamic and a chipotle olive oil blend. Can't wait to try the 18 yr old Balsamic. 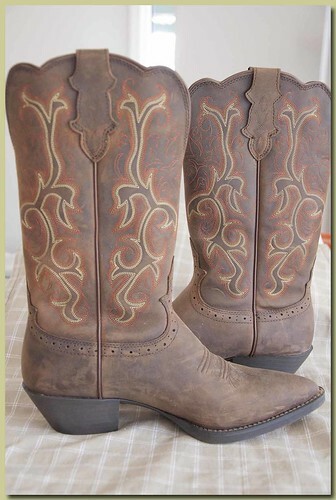 a pair of stinkin' cute western boots. Thanks for taking the trip with us. We enjoyed your company immensely.